“I fought a bear.” That was the excuse one of my mates came out with when he came into school walking like an old man. He stuck to the story admirably, but after about a week he relinquished the real tale. He’d fallen down the stairs. Or, if I remember correctly, up the stairs. 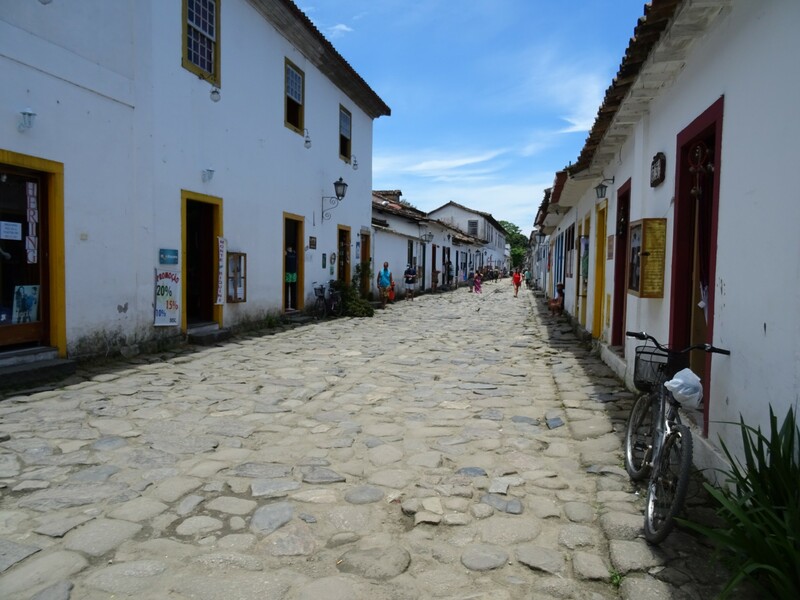 Quaint cobbled streets abound in Paraty. I was thinking about coming out with a similar story of my own, and many people told me I should. Tom said I should say I was saving him when it happened. My own personal preference was that it was the sole blot on twelve rounds with Anthony Joshua. Obviously, he just hopped on a plane to Brazil after beating Dillian White – a, you know, “You should’ve seen the other guy” sort of deal. It’s rather skirting the realms of possibility though, and arguably is not nearly so amusing. 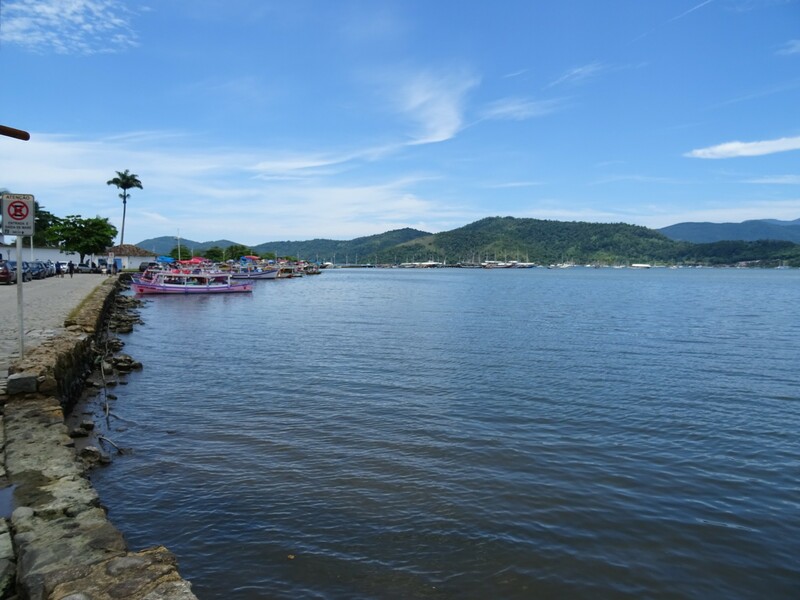 It occurred on my second day in Paraty, and while I’ll come back to some other stuff later, I’m going to focus on this. After all, it was the focus of much of my time there. It all started with an introduction, and a decision. Fishing. The boy is the bait. The decision was simple, 50-50. 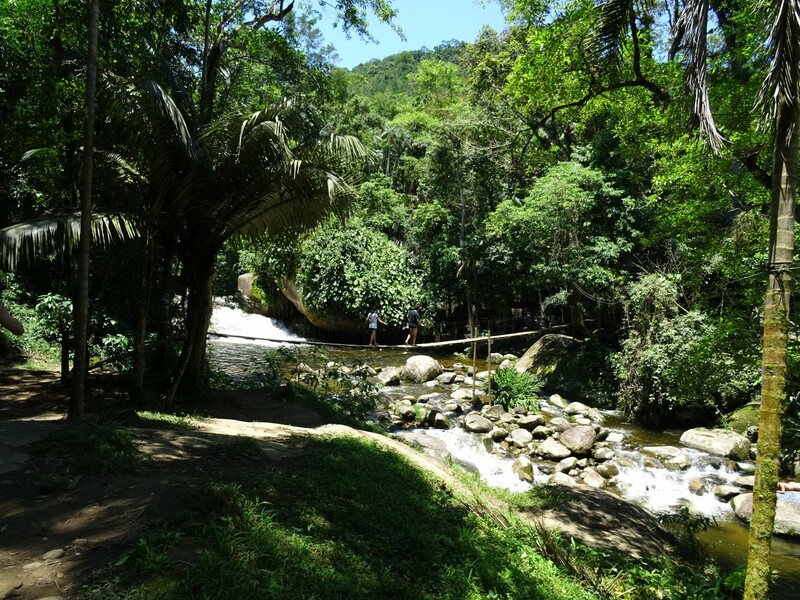 Do I go to Trinidade, with the beautiful beaches everyone had been talking about, or the waterfalls – a bit more adventure, with less sitting about? It was difficult. Not helped by the fact that both supposedly being lovely, I would quite like to take pictures. Whooping around in the water means you’ve got to leave a camera unattended though. It would be much better if I had someone to go with. Struggling to get up. I know the feeling. Enter Tom, an English guy who I saw at breakfast. On the suggestion that he had nothing planned for the day, I asked him if he fancied coming. He was pretty interested in the waterfalls, so there we had it. Introduction and decision. Some cars brave the water. 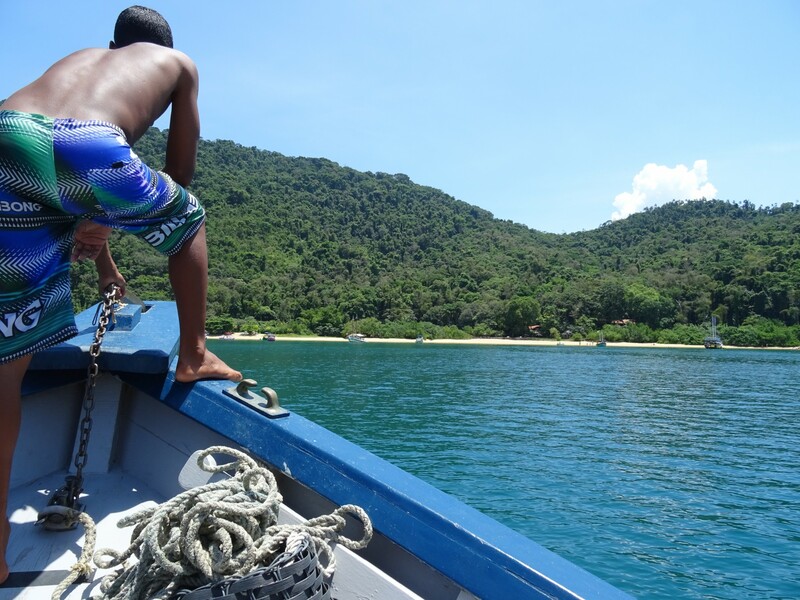 We set off late, around midday, and took the bus through some absolutely stunning scenery. After a bit of confusion, some nice guys told us when we needed to get off, and a short while later we were there. The waterfall. 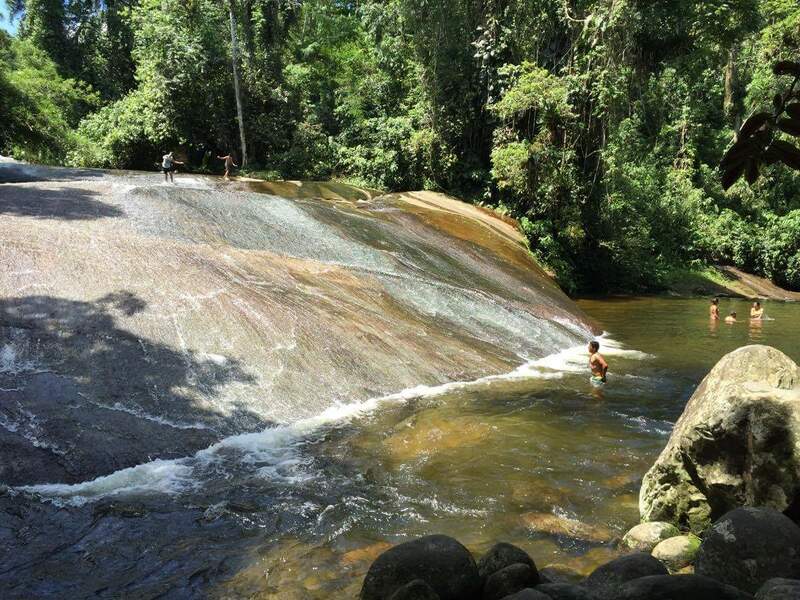 The waterfall slide. Yes, it’s all coming together now, isn’t it? You’ve got to wait yet though. We were actually pretty careful. After watching kids as young as 12(ish) taking run ups, sliding on their feet like surfers, and doing tricks, flips and leap frogs, we quickly made the decision to take it easy. We slid down on our bums. Even that wasn’t without its dangers. Trying to get enough speed to prevent friction stopping us meant starting on our feet. Even when planned though, the transfer from feet to arse wasn’t elegant. It’s a lovely area around the waterfall. We’d slid down a couple of times by the time it happened. One of the kids had shown us a path up the waterfall, without going all the way around. It involved standing on a specific, grey coloured portion of rock that obviously had more grip than the rest. You still had to be careful though, and I was. I hit the deck before I knew what was happening, my head cracking against the rock. As I rolled myself over, checking I still had a full set of teeth, Tom, who had been behind me, had a worried look on his face. 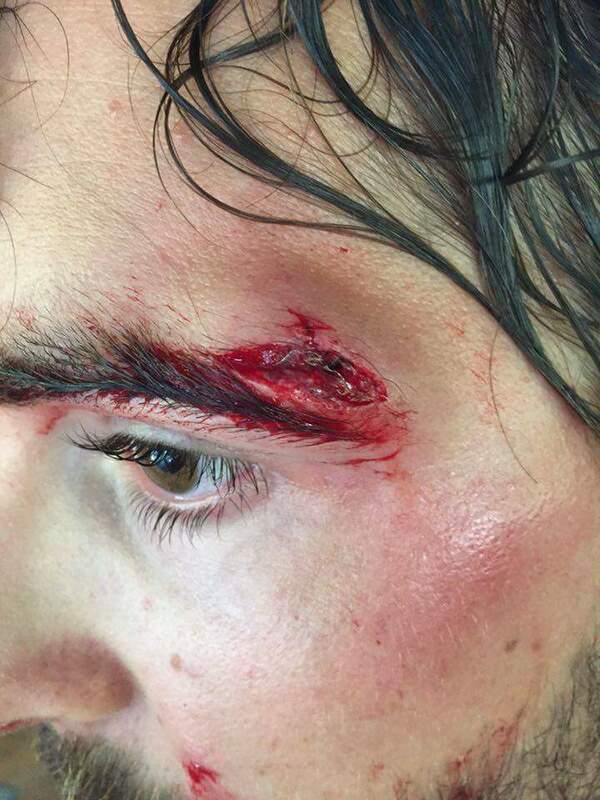 “It looks pretty bad.” There was no dilly dallying about though. The kids had come back down to help, and we slid safely back down to the bottom before making our way round the side to get our bags. 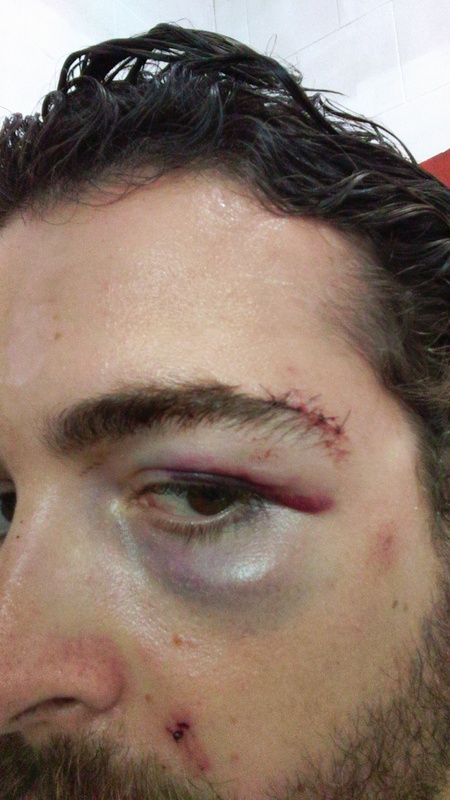 Tom took a picture for me, as I couldn’t see the injury. I couldn’t even feel it really – I assumed more out of shock than anything. It was pretty swollen, and was still bleeding, so we went to the bar signposted up the path, to get something to clean it up. They didn’t look surprised – I suspect they’ve seen this kind of stupidity before. We went back to the hostel, head dripping through my makeshift bandage. I felt bad for ruining Tom’s day, but he maintained that if I hadn’t gone over first, he would have. He stuck around through it all, and when Ilsa, who ran our hostel, concurred that I needed stitches and took me to the hospital, he came along too. I can’t thank them both enough. Bandaged up and looking happy. 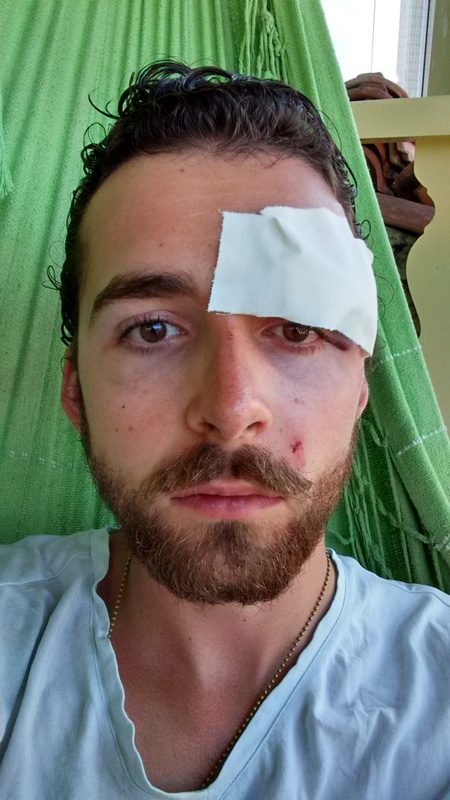 To my surprise, there’s free healthcare in Brazil (provided you bring a passport) so I was sorted in no time – the doctor’s four stitches covered by a giant bandage that prevented me from putting glasses on. Aside from causing me to be looked at as if I was the elephant man while walking around town, it caused other issues too. Mainly that when I went to eat in the evening, it was wet, and because I couldn’t see without glasses I slipped on some concrete and smashed my toe. That hurt more than my head ever did. I guess the moral of the story is simple. Don’t walk up waterfalls. My face has retained it’s general handsome shape at least. Now back to the rest, eh? 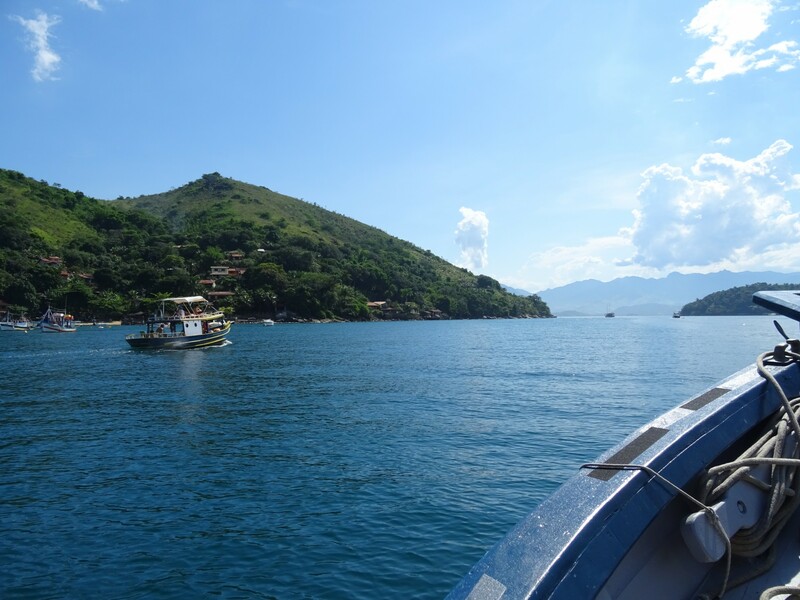 I’d arrived in Paraty on the back of a very hot journey. The air conditioning hadn’t been working, and with no openable windows the bus had quickly turned into a sauna like experience – much like the one we had in our kitchen at Uni. We eventually changed bus, which is when I noticed the most curious thing. My hat was gone. Girls kill for this kind of quality makeup. Normally on the baggage shelf, it was nowhere to be seen. Not down the aisle, nor under any seats. Sure, a few people had gotten off before, but I hadn’t paid any attention – who would steal a 15 reais (three pounds) hat after all? The bus cost 75. Someone decided to. 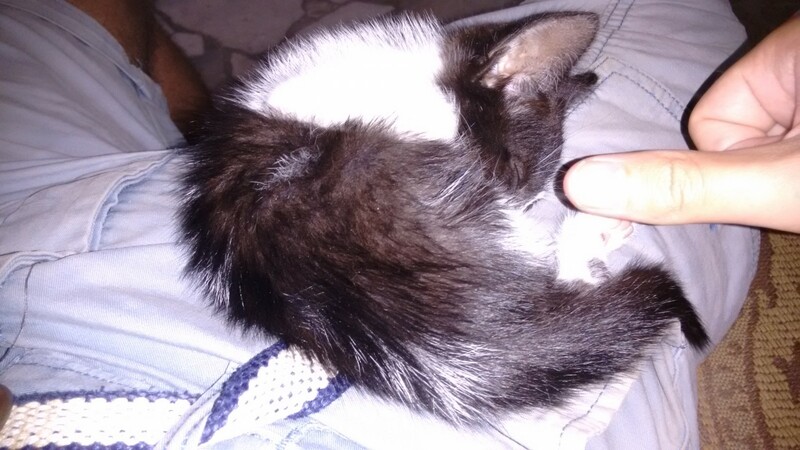 The little fella is helping me recover. 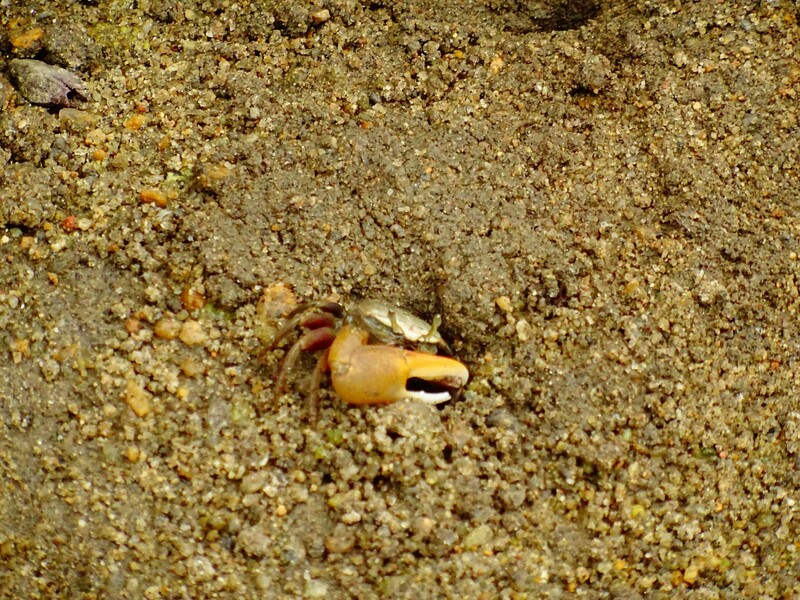 I called him Trevor. Nevertheless, I still had an interesting journey, mainly thanks to Christina, a lively Brazilian on her way to a wedding. For whatever reason, we started talking about music and found our way onto what Brazilian artists I knew, “Only one”, I said. Nando Reis. I only know this because someone bought a CD for my dad, saying Nando looks like him, but apparently Nando is quite famous over here. I’ve been hearing him everywhere, and I quite like it. Lying on this rock is pretty relaxing. Obviously I don’t understand Nando’s lyrics, but Christina sought to correct that. Step by step, line by line, she went over the meanings of songs. I might have forgotten by now, but it really was awesome to get some meaning to them. Not only that, but Christina was a big fan of Pearl Jam, which we played for the rest of the journey. Being as I never meet Pearl Jam fans in the UK I was most surprised. 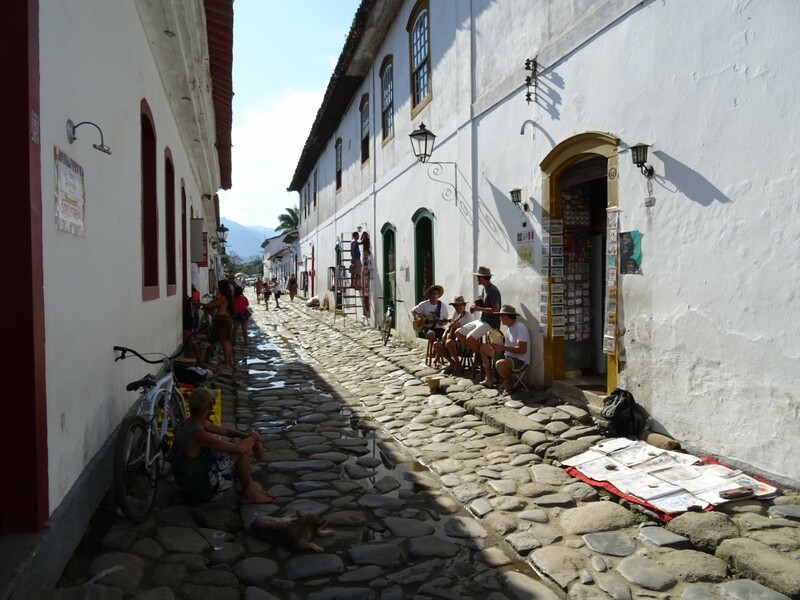 It’d gotten lost in the story, I’m sure, but Paraty is beautiful. The quaint little old town is only the tip of the iceberg, a slightly price inflated area of cobbled alleys and colonial houses. As much as I love the old architecture, it’s the landscape that stands out. 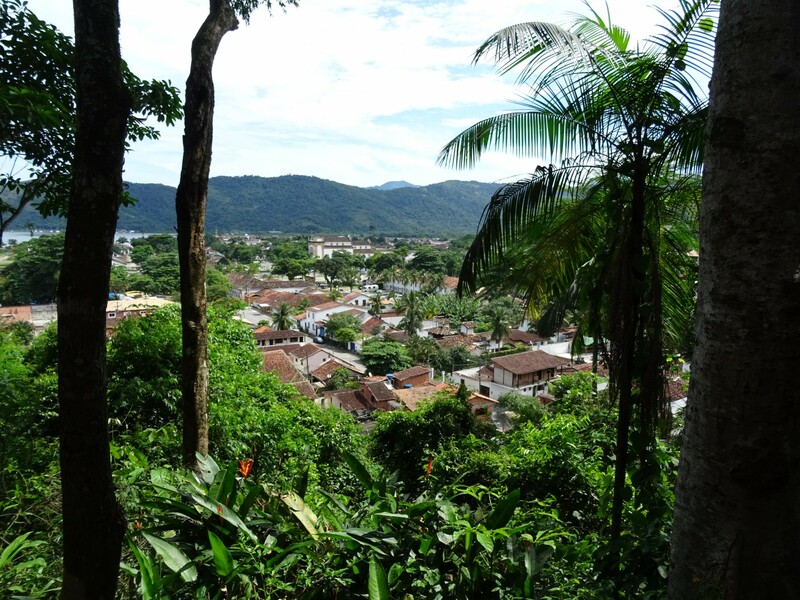 Rolling hills of forests, that hide stunning paradise like beaches and pictureque little coves. 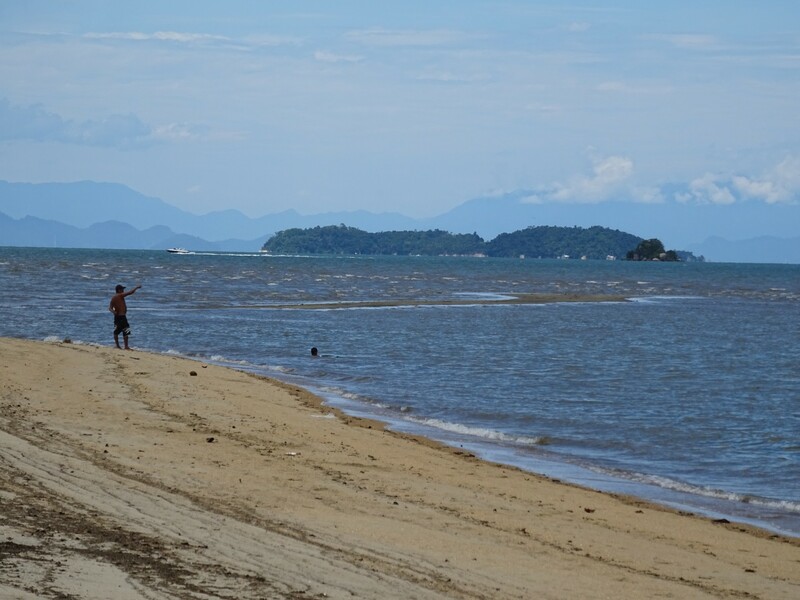 It’s easy to sit and watch the sea for hours in these beautiful surroundings – indeed I found myself doing just that several times. 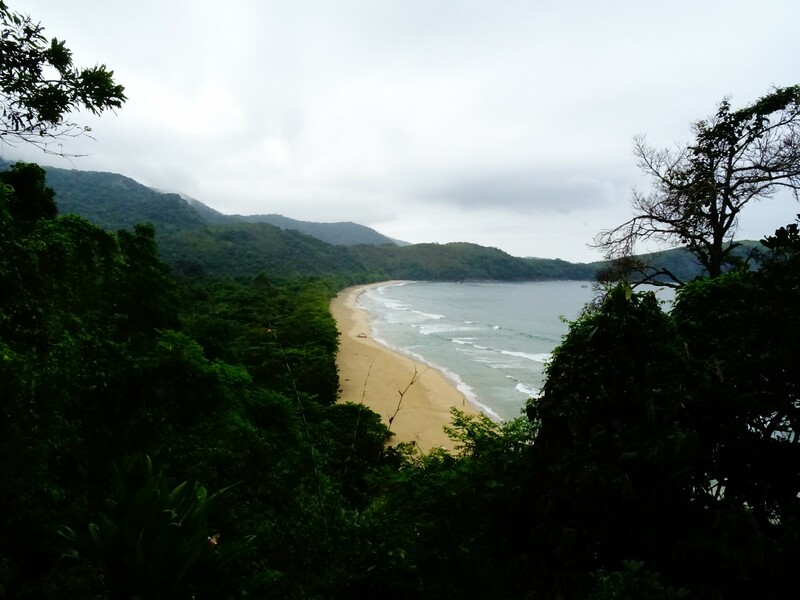 On another day Englantine, Joe and myself trekked through the jungle to reach Praya do Sono, a giant beach so secluded that almost no one was there, aside from a couple of campers. 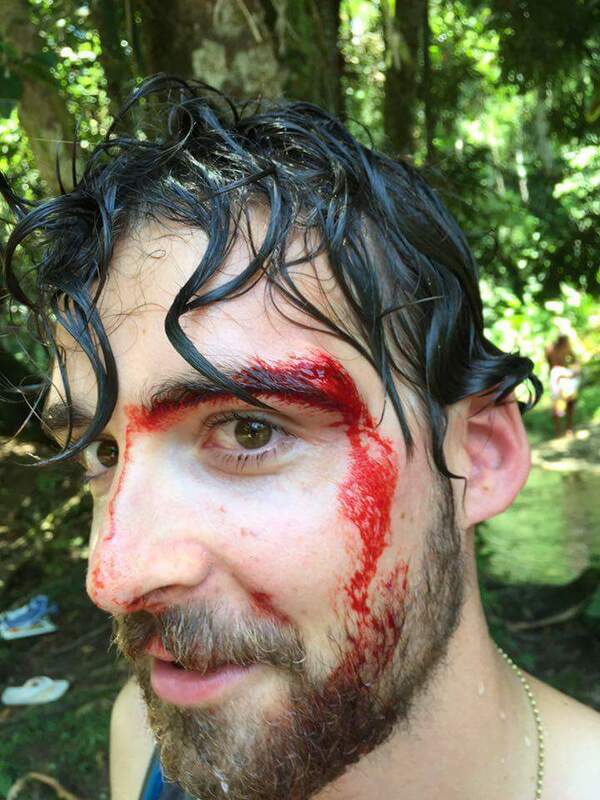 Even with my injured face I was unable to stay out of the water. Despite the weather threatening to rain the whole time, it was lovely – just amazingly peaceful. After we’d finished failing to stand our ground against the waves, we resorted to descecrating Eglantine’s book of drawings, with out own atrocious attempts. We signed them, obviously. Before I left, Joe and I went on the “Caipboat”, with our hostel, Vibe, and a few others including Emily and Brendan. 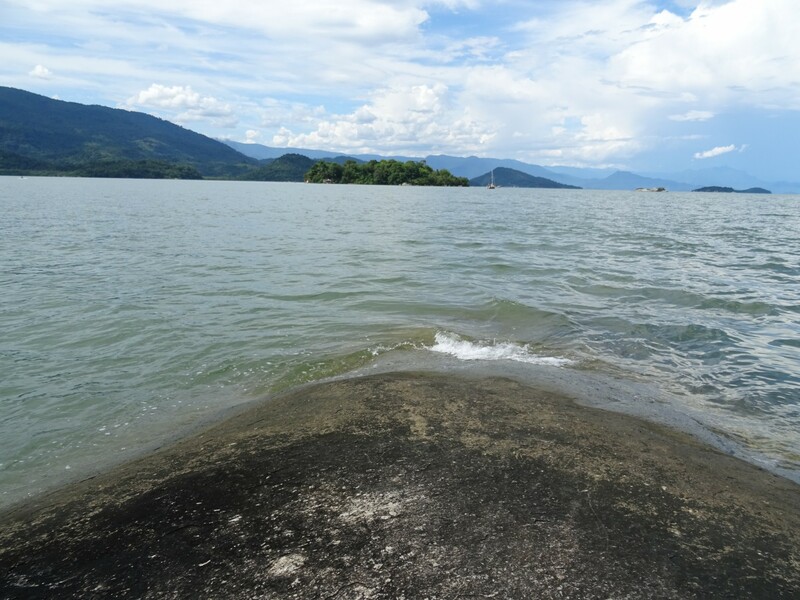 The premise revolves around a day exploring the tiny islands around Paraty, all you can drink caipirinhas included. It’s really a win-win situation. Ever since I drank my first in the Amazon, I’ve steadily drunk more and more – when in Brazil of course. Caipirinhas down guys, we’re coming into shore. The caipirinhas are almost forgotten though, amongst the beauty of the area, as it is stunning – picture perfect azure water, sandy beaches and verdant islands. A bit of cliff diving and an end of day underwater mud fight doesn’t hurt the fun either. 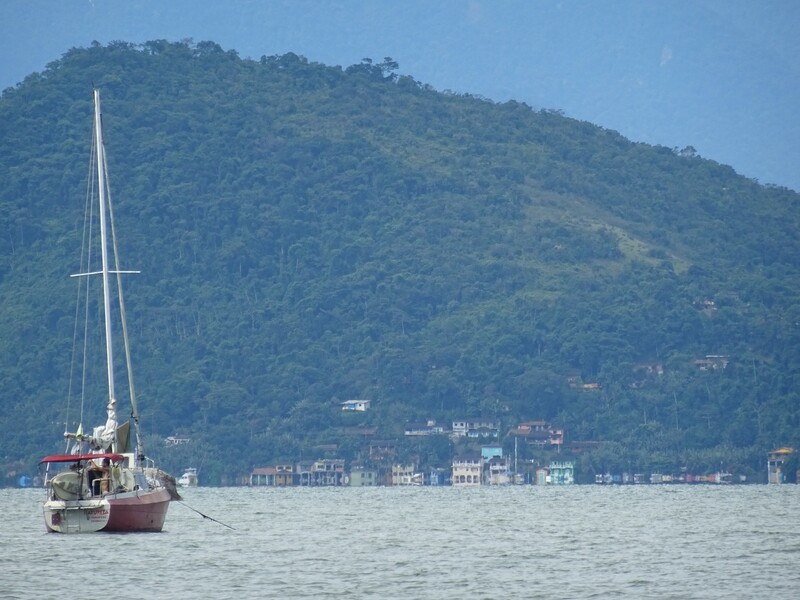 A picture perfect day, perfect to end my time in Paraty on. So long as you don’t lose anything. I’m not sure it gets any more blue. 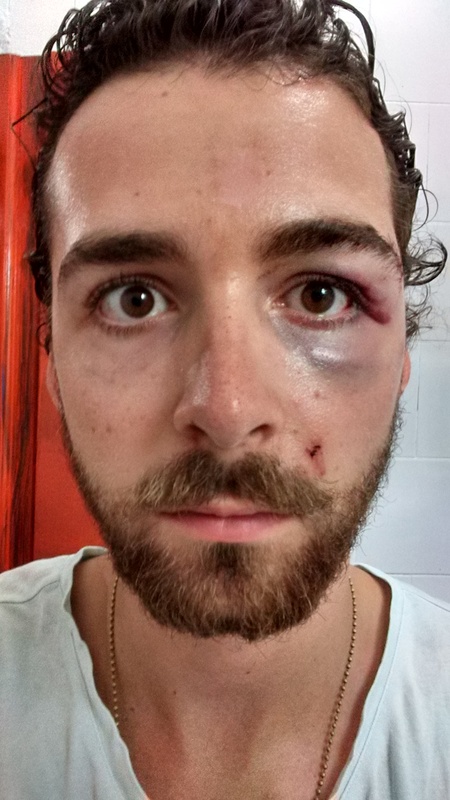 Beaches, Boat Travel, Caipirinhas, Cats, December 2015, Hiking, Injury, Spectacular Views, Waterfalls. Bookmark. Absolutely stunning part of the word Doug. I’d like to know a bit more about the locals though. No sympathy with the head I remember having to stop you doing something similar when you were small in a babies paddling pool. You were twice everyone else’s size but were determined to dive in it. 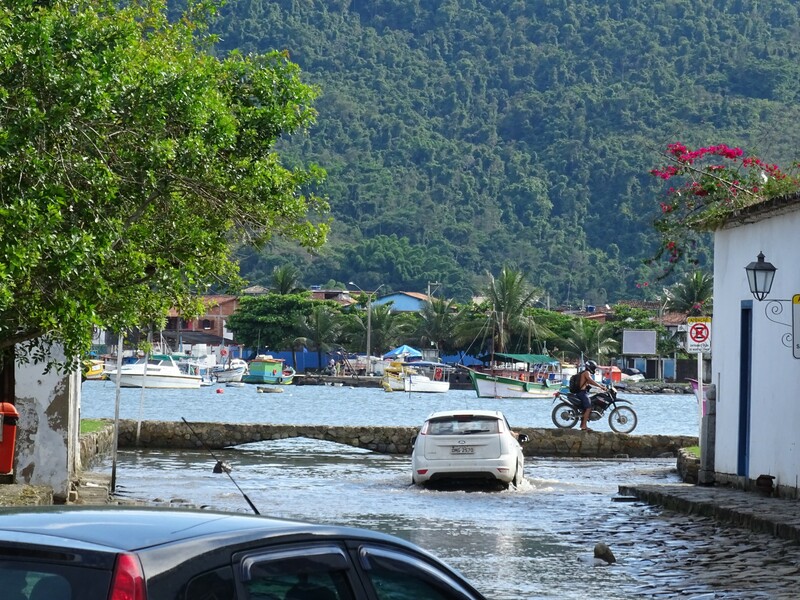 From Paraty specifically or Brazil? I’m pretty sure your no sympathy thing extends to any bad events!